Joanna Kannenberg was born in Katowice in Poland. The ability to speak fluently Polish, Russian, German and English gives her the freedom to communicate directly with people from many different countries. Joanna loves to travel, to explore the world, to meet new people and learn about their lives. She is an entertaining personality and a storyteller who readily shares her adventurous experiences with others. Today she is recognized as a highly qualified professional in the diving world, however she still remembers the days when she struggled to prove that women do not belong only in the kitchen. 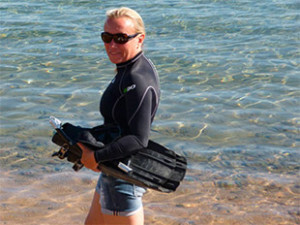 Joanna conducts PADI diving instructor trainings in Poland, Egypt and Russia. In 1983, she performed her very first dive in a lake near the town of Gliwice, Poland and since then diving has become a significant part of her live. At that time diving was not as developed as it is today. The only possibility to continue with diving was in the rescue swimming organizations. Tourism was even less developed than diving. Joanna was diving in Poland, but that was not enough for an active person like her. At age 18, she became a certified tourist guide and worked with American and Yugoslav groups visiting Poland. For Polish groups, she organized and led trips to Asia, which gave her the opportunity to explore diving there. In 1997, Joanna completed her Diving Instructor course in Phuket, Thailand. A passionate learner, she went on to pursue higher education and graduated from the German Sport University in Cologne and then chose the PADI IDC in Thailand to continue her diving education. 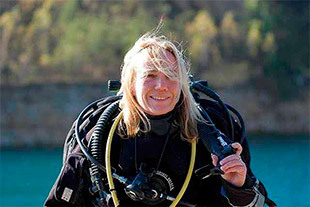 In 1999, she opened one of the first PADI dive centers in Poland. Already during the IDC it was Joanna's goal to rise to the top and she was determined to work hard to achieve the PADI Course Director level. In 2000, she successfully completed the PADI Course Director Training Course in Malta and has been working with students and motivating them to continue their education and set their own goals ever since. 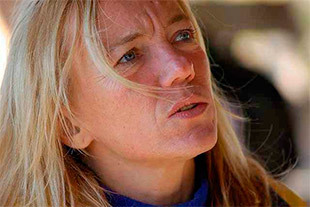 In 2009, she was awarded the «Platinum PADI Course Director» status. For many years Joanna said that technical diving was nothing for her ... until she tried it! Today, she also trains technical instructors. The first of them came from other organizations and were really surprised by PADI’s new technical programs, all of which offered new opportunities and diversity in diving education. Each dive brings great photo opportunities, so it is no wonder that underwater photography is one of Joanna’s passions. Unfortunately, at present there is no time for photography. to have more time for her daughter and her hobbies. Joanna`s daughter Katharina became a PADI Master Scuba Diver at the age of 12. Meanwhile, she also works as a diving instructor. Currently she is a medicine student, but when she finds some free time, she looks forward to new trips and next dives. Joanna tries to spend as much time as possible together with her daughter. They go on holiday together and do what they do best — diving! A sharp contrast to diving is Joanna’s other passion – skiing... of course, at the advanced level, including firn-skiing and the steepest slopes.